Multidentate (or polydentate) ligands contain three or more potential donor atoms and are widely used in coordination chemistry to bind to and impose specific geometries around metal centres. Judicious choice of the appropriate donor atoms and their spatial arrangement within the ligand architecture can enable the selective binding of specific metal ions and the formation of highly stable complexes. Ligands based around the triphos scaffold (R’E(CH2PR2)3) (Fig. 1) are amongst the most commonly studied facially coordinating triphosphine ligands. Whilst these ligand systems have found use in catalysis (ACS Catalysis, 2015, 2500), they have yet to be applied to biomedical imaging and the design of new molecular probes. Controlling isomer formation is a key challenge in designing 99mTc SPECT imaging agents and facilitating translation to the clinic. The tripodal ligands can ‘lock’ the coordination geometry around a metal, usually in a facial arrangement and thus prevent isomer formation. The topology of the ligand can also influence the rate at which metal complexation occurs, a factor that is of critical importance in the preparation of radiopharmaceuticals. 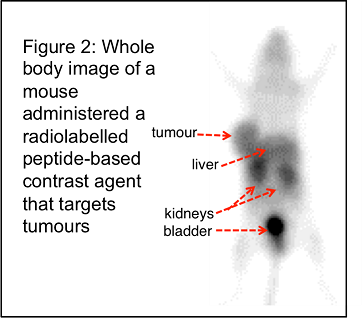 The use of phosphines in nuclear medicine is well-established e.g. 99mTc-tetrofosmin and 99mTc-TechneCard utilise 1,2-bis(bis(ethoxyethyl)phosphino)ethane and tris(3-methoxy-1-propyl)phosphine respectively and are currently used as myocardial perfusion agents for heart imaging (J. Nucl. Med., 1993, 30; J. Nucl. Med. 1987, 1870) but issues remain in stabilising certain oxidation states of Tc, and utilising stable phosphorus-containing ligands that form well-defined and isomer-free complexes. The project involves linear and tripodal multidentate phosphines for chelation to 99mTc and 188Re. There will be in-depth investigations into the various topologies that the ligands can offer, as well as iterative design of the ligands with variations in donor atom, apical atom and the bridgehead distance. Functionality will be built into the phosphine substituents to allow for bioconjugation and the introduction of targeting peptides for applications in cancer imaging. Ligands used in the formation of 99mTc diagnostic agents will also be utilised with the -emitter 188Re, thus providing potential therapeutics to complement 99mTc diagnostic radiotracers (Fig. 2). The project will comprise (i) synthetic inorganic and organic chemistry i.e. metal coordination chemistry and ligand design, (ii) radiochemistry and bioconjugation and (iii) in vivo peptide receptor targeting and radiobiology.